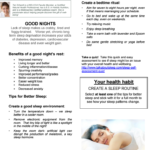 Getting a good night’s sleep can reap many positive rewards including increased energy and a healthier lifestyle. Read on for tips for better sleep habits and increased energy at work. Looking for ideas on how to improve your posture? See below for tips and remember to straighten up during your daily activities. Not only will it improve your health, it can help to increase your height!